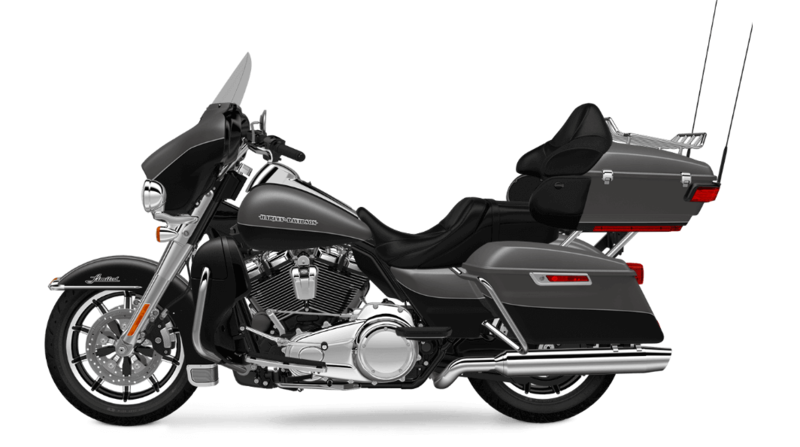 One of the most popular bikes in the Harley-Davidson® Touring Lineup, the Ultra Limited delivers style and performance. This is a top-shelf touring bike that provides all the features you need to make those long rides from Lakewood comfortable and easy. For the 2017 model year, the Ultra Limited also comes with an upgraded engine that delivers more power and more performance for cruising down Colfax Ave. Find the new Ultra Limited here now at Avalanche Harley-Davidson®. The Ultra Limited includes the latest in touring bike design to deliver more control and more convenience. It’s loaded with smart features to make your ride better. <strong>All-New Milwaukee-Eight™ 107 Engine: This is a brand new V-Twin in the long tradition that includes the Panhead, Shovelhead, and other iconic Harley engines. It produces more power than ever before, with a cooling running temperature for more comfort. It’s also designed to run smoother thanks to rubber mounting and counter-balancing, and the exhaust note is just as sweet as ever, thanks to a carefully tuned exhaust system. <strong>Overview Milwaukee-Eight™ 107 Engine: The new Milwaukee-Eight™ is a modern marvel. With 107 cubic inches of displacement, a single chain driven cam, dual spark plugs, and four valves per cylinder, it puts out more power for fast acceleration. On top of that, it maintains a cooler running temperature and offers smoother operation. The new engine even deliver 50 percent more charging power so you can keep your accessories fully powered during the ride. <strong>Daymaker™ LED Headlamp and LED Fog Lamp: With a massive 2,136 lumens, the Daymaker™ front lighting setup delivers enough illumination to light the road ahead for 450 feet. You’ll hardly notice when the sun goes down. H-D® Smart Security System: You can rest easy knowing that your ride is protected by smart security system. A wireless keyfob automatically activates the system when you step away from your bike, and it deactivates when you come back. Reflex Linked Brakes with ABS: Slow down in a hurry even on the rough roads of Aurora. This system offers confidence and control thanks to powerful brakes and an anti-lock brake system that makes wheel lockup a thing of the past. Ergonomically Designed Hand Controls: These smart controls keep your hands in the right place so you stay comfortable when you’re riding all day. With all the controls you need right there on the bars, it’s easy to stay focused on the road. Air Adjustable Suspension: Dial in the suspension settings that make the most sense for your ride, the road surface, and the amount of weight you’re carrying. It’s easy and all it takes is the twist of a knob; no tools required. Steering Head and Forks: Oversized forks don’t just make for a mean look. They’re also there to add confidence and stability when cornering and braking. Brembo® Brakes: Brakes from the best name in the industry deliver unparalleled stopping power. The four-piston front and rear system includes a dual front rotor to make sure you can haul things in quick. Six-Speed Cruise Drive® Transmission: With six gears, you’ve got the perfect ratio to maximize the capability of the big V-Twin. You’ve also got a tall top gear for smooth, quiet highway cruising down I-25. <strong>Dunlop® Multi-Tread™ Tires: With 180mm tires, you’ve got a huge contact patch that grips the road like nothing else. High tech compounds help provide both cornering performance and long term durability. These days you expect all vehicles, motorcycles included, to come with the latest in high tech features. The Ultra Limited delivers all the newest perks to make your ride a comfortable one. 5.25-inch Speakers: A set of 5.25-inch speakers delivers crystal clear volume for all your tunes. Voice Recognition and Bluetooth: So you can focus on the road and still take advantage of your infotainment system, the Ultra Limited comes with voice recognition and handsfree phone use. 6.5-Inch Color Touchscreen: You’ve got easy access to all connectivity and entertainment features through this big bold high definition touchscreen display. <strong>The Boom!™ Box 6.5GT Radio: This smart infotainment system pumps out 75 watts per channel at only 1 % distortion, and it includes a factory tuned equalizer and a speed sensitive volume controller. Harley-Davidson® provides more comfort, more style, and more control, for the best possible touring experience. That’s the feeling you get when you ride the Ultra Limited. Fairing Design: The batwing fairing used on the Ultra Limited is the result of thousands of miles of real world testing in addition to thousands of hours of wind tunnel and computer testing. The result is a fairing that reduces head buffeting to keep you comfortable. Wide Set Handlebar: With a wide handlebar, you can comfortably stretch out and take control of the Ultra Limited. It’s the perfect position to ride all day in a relaxed, comfortable posture. 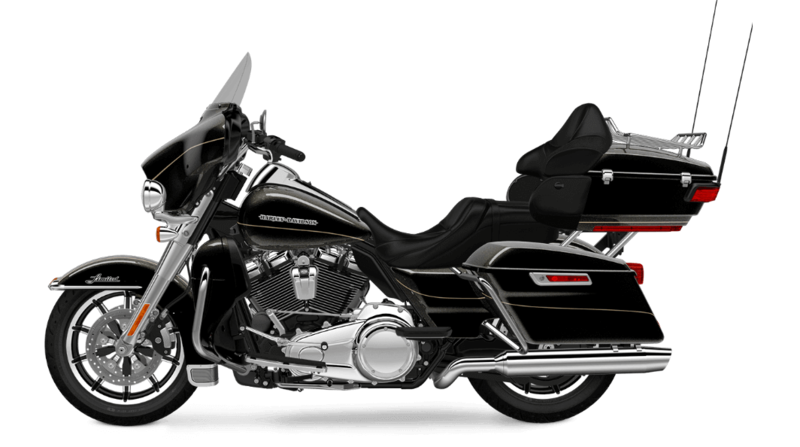 One-Touch Design Philosophy: Harley-Davidson® decided that simpler is better. 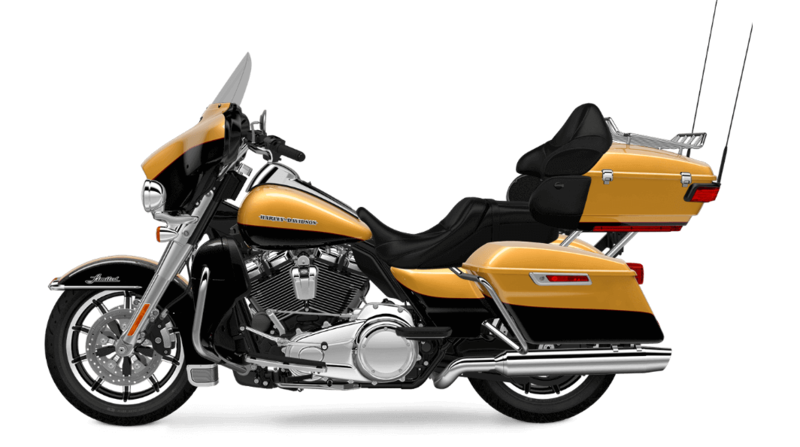 That’s why you get one-touch saddlebags, one touch luggage carrier, and one touch fuel door. Full Length Floor Boards and Heel/Toe Gear Shifts: Designed around comfort, these full length floor boards include a rubber isolated pad to reduce vibration and improve comfort. Saddlebag Design: These sleek saddlebags are completely weatherproof and easily lockable, for peace of mind when you’ve got to step away from your bike or when you get caught in a rain storm. Battery Charging Harness: You’ve got to have a battery charging harness, and the Ultra Limited comes with one standard so you don’t have to spend any time installing one yourself. Tour-Pak® Luggage Carrier: Stash two full helmets conveniently in this pack. It even comes with an integrated latch and premium paint. Passenger Seat Space and Leg Room: Nobody is going to complain about more space. We’ve added more of both leg room and seat space for your passenger so everyone is happier. Fairing Lowers: Just like the batwing fairing, the fairing lowers are designed to help protect you from wind, rain, and road debris, and that’ll keep you happy on the long rides ahead. Heated Hand Grips: The Ultra Limited come with heated handgrips, a standard feature, to help keep you comfortable on the coldest days and nights in Lakewood. Cruise Control: Cruise control can help reduce fatigue on those long, flat stretches of highway. 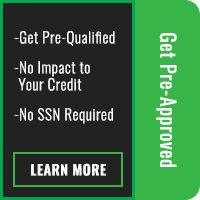 Take advantage of this standard feature. We think you’ll agree that the Ultra Limited is a stylish bike. There are many features that help add up to the total package and help turn heads wherever you ride. High Flow Airbox: Gulping down air and looking good is the primary role of this high flow airbox. More air helps boost combustion efficiency and this box adds a bit of chrome flair to the side of the bike. What more could you want? 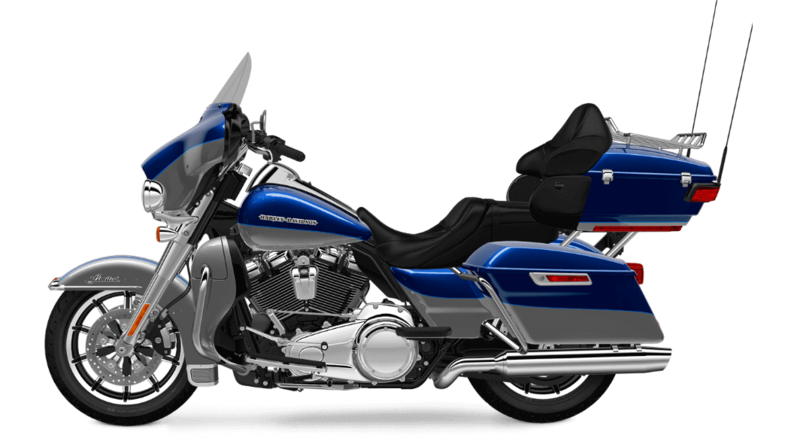 Restyled Fairing and Fender: The iconic look of a decked out touring bike from Harley-Davidson® is unmistakable. The Ultra Limited gets full wrap fenders with unique chrome accents and stylish modern fairings. Bullet Turn Signals: Nothing looks as good as these iconic, bullet chrome turn signals. If it isn’t broken, why try and fix it? Inner Fairing Design: This gloss lack inner fairing makes it easy to find all the controls and gauges you need. Restyled Fairing and Fender: The iconic shapes of the batwing fairing and wrap-around fender are unmistakable. They’re also practical, helping to keep you protected from wind, rain, and road debris. Inner Fairing Design: There’s a bigger display screen and 10 percent larger viewing area with wider, taller numbers sitting on top of that classic black background. 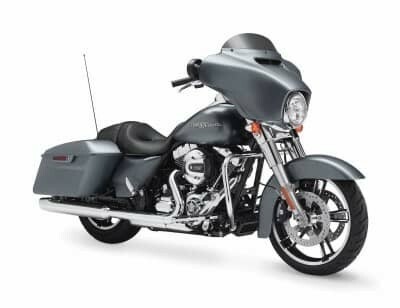 Classic Fuel Tank: This classic paint-matched fuel tank is pure Harley-Davidson® style, and with six gallons of capacity, it offers the kind of range you want from a touring bike. 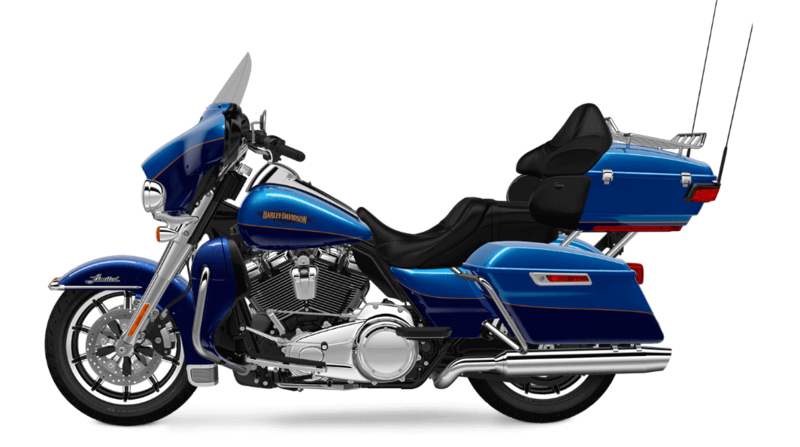 Pure Harley-Davidson® Styling: The new Milwaukee-Eight™ might be new, but it provides classic style. Bright polished cooling fins, chrome rocker covers, and a big, bold racing inspired scoop-style air filter cleaner cover. Tank and Fender Badges: This isn’t just a motorcycle. It’s a work of art, and it receives signature metal badges on the fuel tank and fender.